The total procurement for the Growlers, including spare parts, spare engines, ALQ-99 pods and some length of (possibly lifetime) support was $3.7 billion (not sure if that's AUD or USD) for 12 jets. $300 million is almost certainly an overestimate, with spares being able to go onto the other 11, etc, but there's probably some amount of $ that's effectively wasted on contractor support services that won't be needed to the same degree any longer (ie some contractors whose average work day just became ~9% lighter, but are still getting paid the same). viewtopic.php?f=58&t=23043&p=380155&hilit=growler+cost#p380155 PAGE 46 this thread. "...It ended up being cheaper just to buy 12 brand new Growlers at $1.5 billion ($125m each) …"
Any word on using that bird as a (slightly toasted) hangar queen for parts? Or was everything burned to a crisp? If it was an uncontained engine failure, one engine is certainly toast, but could the other engine potentially be a spare (assuming it didn't burn up or get flailed)? Could there even be useful spare parts from the engine that threw a shoe? Or will that likely be a total wreck? "...Six months on from the fiery mishap, the Defence Department has confirmed the damaged Growler has since been "withdrawn from service" and the department has begun examining how it can recover the cost of the aircraft, believed to be worth $120 million…. 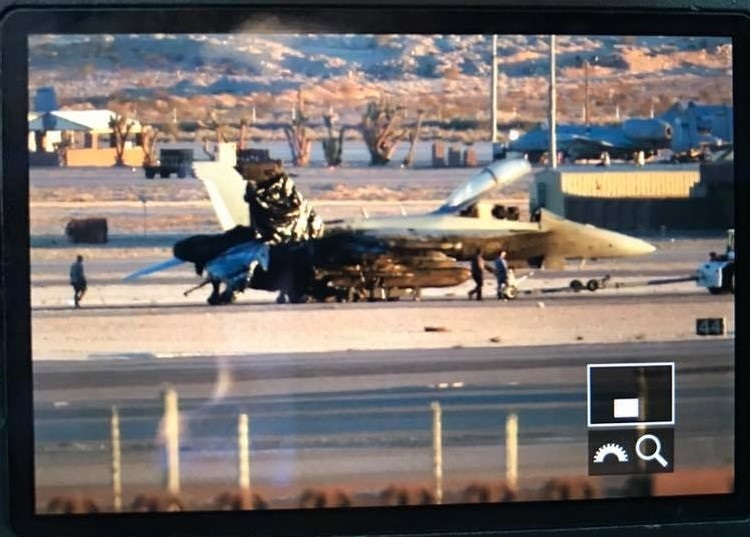 ...The investigation has confirmed a high-pressure compressor in the Growler's engine had broken into three major pieces, with one segment piercing through the bottom of the jet and taking a chunk out of the runway. 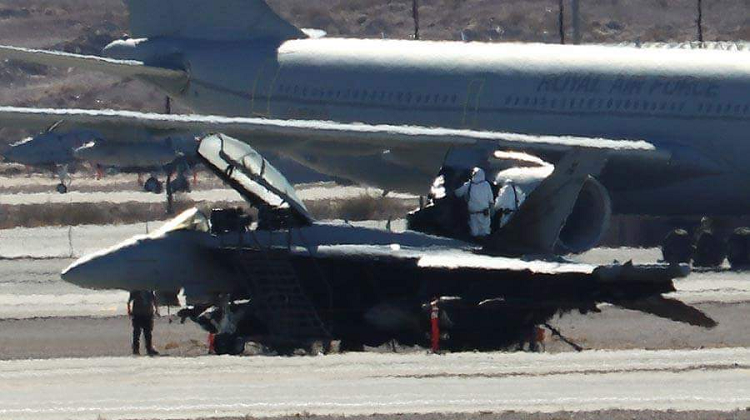 As the jet came to a halt, the rear fuselage was engulfed in fire, the main undercarriage collapsed, and two of the three ALQ-99 electronic jammer pods it was carrying were severely damaged…. ...The Defence Department says it is exploring options for the "recovery of economic losses resulting from the incident" now that the aircraft has been assessed as "beyond economic repair". "Due to contractual arrangements, this process is expected to take a period of time," the Department said. Senior Defence figures say any compensation claim would likely go first through the US Navy, then to the airframe manufacturer Boeing, then to engine maker General Electric, and finally to the engine component supplier. The RAAF has 11 jets remaining in its Growler fleet but is yet to decide whether it will replace the damaged aircraft." steve2267 wrote: Any word on using that bird as a (slightly toasted) hangar queen for parts? Or was everything burned to a crisp? If it was an uncontained engine failure, one engine is certainly toast, but could the other engine potentially be a spare (assuming it didn't burn up or get flailed)? Could there even be useful spare parts from the engine that threw a shoe? Or will that likely be a total wreck? "...The gradual introduction of the NGJ systems onto U.S. and Australian Boeing EA-18G Growlers will initially augment the ALQ-99 before eventually replacing the legacy capability, according to NAVAIR." "TAE Aerospace will develop a Turbine Engine Maintenance Facility (TEMF) in Bundamba, south-east Queensland, which will support in-country sustainment of Australia’s fifth-generation F-35A Joint Strike Fighter (JSF) aircraft. The TEMF will enable deeper-level maintenance, where JSF F135 engine modules are disassembled, repaired and reassembled for testing. The Minister for Defence, the Hon Christopher Pyne MP, said the new facility was a testament to the strength of Australia’s defence industry and the contribution it made to the global F-35 Program. “TAE Aerospace’s new facility will support maintenance, repair, overhaul and upgrade (MRO&U) activities for not only Australian F135 engines but also engines from around the Asia-Pacific region and the world,” Minister Pyne said. The Australian Government has approved the acquisition of 72 F-35A JSF aircraft to replace the current fleet of 71 ageing F/A-18A/B Classic Hornets. “The global F-35 Program has had a positive impact on Australia’s growing defence industry, which has collectively been awarded in excess of $1 billion in production contracts and will support up to 5000 Australian jobs by 2023,” Minister Pyne said. 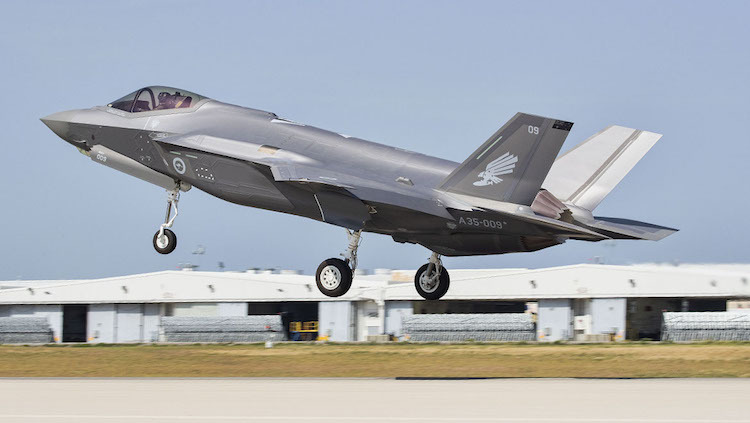 ...Australia has committed to buying 72 F-35As under Project AIR 6000 Phases 2A/2B, which are scheduled to be delivered by 2023 to replace the RAAF’s F/A-18A/B Hornets. RAAF Initial Operational Capability with the F-35A is planned for December 2020." Photo: "RAAF F-35A A35-009, taking off from Luke Air Force Base, Arizona. (Defence)"
"...Air Vice Marshal Deeble: The first two aircraft were purchased under LRIP 6, and they were delivered in 2014. The next aircraft that we will receive will be Low-Rate Initial Production 10. That will be in 2018. Eight aircraft will be purchased at that point in time. The following year, in LRIP 11, we will purchase another eight aircraft. Following that, on an annual basis, we will be purchasing 15 aircraft each year out to 2023, where we will purchase the last nine aircraft to take us to a total of 72 aircraft.…"
"RAAF Base Williamtown will be the scene of national defence force history when the first two of 72 F-35A Joint Strike Fighters (JSF) arrive on Australian soil for permanent residency on Monday, December 10.... the aircraft will be operated by Number 3 Squadron to be commanded by Wing Commander Darren Clare. Hopefully before testing gets going they'll do a lap around the country to show everyone that they're here ........................ finally. element1loop wrote: Hopefully before testing gets going they'll do a lap around the country to show everyone that they're here ........................ finally. And do a low altitude supersonic pass over Carlo Kopp's place. NOT a KOPPuLater for Kopp but anuvver Oz ScientificBod gets a US Medal for F-35 work. "Australian Defence scientist Paul Marsden has been awarded the US Secretary of Defense Medal for Exceptional Public Service, the highest award of the US Office of the Secretary of Defense for a non-US civilian. Marsden has been recognised by the US Secretary for Defense for developing software estimated to save more than US$33 million over the life of the F‑35 program. Minister for Defence Christopher Pyne congratulated Mr Marsden on his innovative work that converts raw flight data into an easily readable form…. ...“This data conversion software means the Joint Strike Fighter program will save on recurring costs by no longer relying on the original equipment manufacturer to interpret the data,” Minister Pyne said. “Paul is the third Australian Defence scientist to receive this prestigious award in the last four years, which is a great indicator of Aussie ingenuity and the calibre of personnel going to the US for postings,” Minister Pyne said."